Immune system cells are able to extrude stringy DNA webs as weapons to fight invading microbes. Neutrophils, the most abundant type of white blood cells, use the so-called extracellular traps—a meshwork of DNA, histones, and antimicrobial proteins derived from the neutrophils’ granules—to immobilize and kill bacteria and fungi. This process results also in the death of the neutrophils themselves. However, according to a recent study, other immune cells also extrude stringy DNA, albeit of a different nature and with different functions—instead of the DNA contained in their nucleus (the so-called nuclear DNA), they release mitochondrial DNA, or mtDNA for short. The extruded mtDNA does not immobilize and kill invading microbes—rather, it participates in inflammatory responses. The study (Lymphocytes eject interferogenic mitochondrial DNA webs in response to CpG and non-CpG oligodeoxynucleotides of class C) was published in the journal Proceedings of the National Academy of Sciences in January 2018. For the study, researchers isolated several types of immune cells from the blood of different donors. Then, they exposed the immune cells to a variety of triggering molecules. When exposed to a specific type of oligonucleotide that resembles DNA from pathogenic microbes, the cells rapidly ejected weblike strands of mtDNA. After ejecting the mitochondrial DNA, the cells remained intact and healthy. The researchers also found that the web of mtDNA released from lymphocytes sends signals to the surrounding cells. These signals, or danger signals, alert the immune system that the body is under attack, causing other white blood cells to release the cytokine “interferon type-1″, which helps the immune system to fight the invading microbes. Thus, the researchers identified a novel role played by lymphocytes—they communicate danger by releasing mtDNA, which in turn initiates an inflammatory response through release of interferon type-1. High levels of interferon type-1, the cytokine released in response to the formation of the mtDNA webs, are present in several autoimmune diseases and several types of cancer, which are associated with high levels of inflammation. Neutrophil Extracellular Traps (NETs) are thought to entrap and destroy pathogens by using a combination of antimicrobial peptides, DNA, and associated histones. I thought it was interesting that they could also cause host tissue damage. In the case of periodontitis, neutrophils exhibit hyperactivity and hyper-reactivity in terms of ROS production in patients with chronic periodontitis which could possibly contribute to its pathogenesis if not removed appropriately. What are some other inflammatory diseases where NETs become deleterious when produced in excess? A high level of mtDNA in the blood may lead to SIRS (Systematic inflammatory response syndrome) which is an inflammation throughout the body that can cause organ failure and be fatal. Unusual high levels of mtDNA can be also found in individuals that suffered individual organ failure such as liver failure, cardiac infarction or cerebral ischaemia. Chronical inflammatory diseases such as arthritis have been also linked to a high mtDNA. High levels of mitochondrial DNA were discussed but what about the effects of mitochondrial DNA deletion? I found an article discussing syndromes in children associated with mitochondrial DNA depletion. Mitochondrial diseases can be caused by defects in either the mitochondrial genome or the nuclear genome. This impairs the cross talk between the mitochondrial and nuclear genome, which results in impaired qualitative and quantitative mtDNA integrity. Mitochondrial DNA depletion syndromes (MDSs) have an autosomal recessive pattern of transmission and are characterized by the amount of mtDNA in tissues and organs. The MDSs are divided into four groups, hepatocerebral, myopathic, encephalomyopathic and neurogastrointestinal, each with different periods of onset. For example, a child with the myopathic mtDNA deletion syndrome will have an onset period from infancy to early childhood and will present with symptoms such as hypotonia, which is a state of low muscle tone and reduced muscle strength. A child with hepatocerebral mtDNA depletion syndrome will have an onset period from neonatal to early childhood and will present with symptoms of hepatic dysfunctions. The hepatic dysfunction could lead to lactic acidosis, which is a buildup of lactic acid in the blood resulting in excessively low ph in the bloodstream. NETs can have an adverse effect in many diseases of the lung. NETs have been found in and contribute to the pathology in the lungs of patients with cystic fibrosis, allergic asthma, lungs infected with pathogens, and lung injury. Many of these diseases run in parallel with a considerable increase in neutrophils in the airways. Parts of the NETs are damaging to the host tissue. NETs contain DNA, histones, and cytotoxic enzymes. 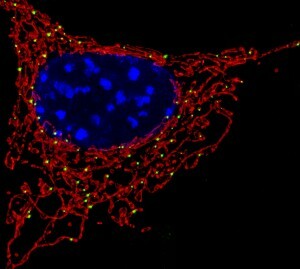 Pulmonary surfactant protein D (SP-D) increases the disposal of dying cells and DNA via macrophages when bound to NETs. In these lung diseases mentioned above, the SP-D levels in the lungs is altered, and it leads to the build-up of DNA in the lungs. I found it interesting that after mtDNA is released, constant inflammation occurs when they aren’t removed from the blood and remain in the system. I wondered what clearance mechanisms are used and why they would fail. While extracellular internalization of mtDNA isn’t known for sure, Boyapati, et al. suggest that mtDNA could be phagocytized by macrophages in an attempt to resolve inflammation. In certain instances, when mtDNA hasn’t been cleared by non-apoptotic cell death, it remains inside of “cellular corpses”. Essentially, once the mtDNA filled cellular corpses are phagocytized, mtDNA is being re-released into the blood and sending more stress signals and, therefore, more inflammation. This is the opposite the usual roles of the corpses, with one role being to suppress transcription of pro-inflammatory cytokine genes. This all makes sense when I think of autoimmune diseases like arthritis where patients have constant recruitment of the inflammatory response. I question how much of an effect diet would have on mtDNA release rates. Great thought! I had similar thoughts while reading this article. I decided to do some research on the relationship between diet and mitochondrial DNA. Although I was not able to find any information about diet, I did come across an article in which discussed how mitochondrial DNA damage was greater in patients with diabetes mellitus and clinical atherosclerosis (which is plaque building up in your arteries). These two diseases are very common in America and are highly related to everyday diet as everyone knows. This article described the association of mitochondrial DNA damage and the baseline pulse in relation to mitochondrial dysfunction. The mitochondrial DNA damage in peripheral blood mononuclear cells was higher in both diabetic mellitus and atherosclerotic disease patients. Since this is so, do you think patients with such diseases (diabetes and atherosclerosis) will have a delayed or dysfunctioning immune response due to the impaired mitochondrial DNA and slow the process of healing after an infection encounter? (an example may be: damaged mtDNA causing a delayed signaling response to surrounding cells) Here is the research below if you are interested. Understanding the way mtDNA excretion signals the release of interferon type-1 in other lymphocytes could open the door to further understanding of how to regulate the over production of interferon type-1, which can be a factor in certain autoimmune diseases and cancers. In the study titled Nuclear RNF2 inhibits interferon function by promoting k33-linked STAT1 disassociation from DNA researchers linked the deficiency of RNF2, a protein associated with the post-translational modification of interferon type-1, to overproduction of interferon type-1 in lymphocytes. RNF2 works by tagging interferon type-1 with ubiquitin which will then be broken down by the cell’s proteasome. Understanding how these interactions occur, it may be possible to create a drug that causes a specific signal transduction which would cause the over production of RNF2. This could lead to a reduction of interferon type 1 released by lymphocytes in patients with certain cancers or autoimmune diseases. I think it is interesting that the mitochondrial DNA web at first glance is a technique used by the body to alert the immune system that it is under attack but as stated in the article research is being done to reduce the release of mtDNA. The over release of mtDNA can lead to unintentional inflammation and release of cytokines which will eventually cause damage to the body via migration of different lymphocytes. So, there is a delicate balance to how much mtDNA must be secreted to warn the body and to not damage it and I was curious as to how the mechanism for this mtDNA release happens. Researchers have found that that a pore-forming toxin pneumolysin (PLY) induces mitochondrial dysfunction leading to release of mitochondrial DNA (1). PLY is the major virulence factor in Streptococcus pneumonia (S.pn. ), the pathogen leading to pneumonia. 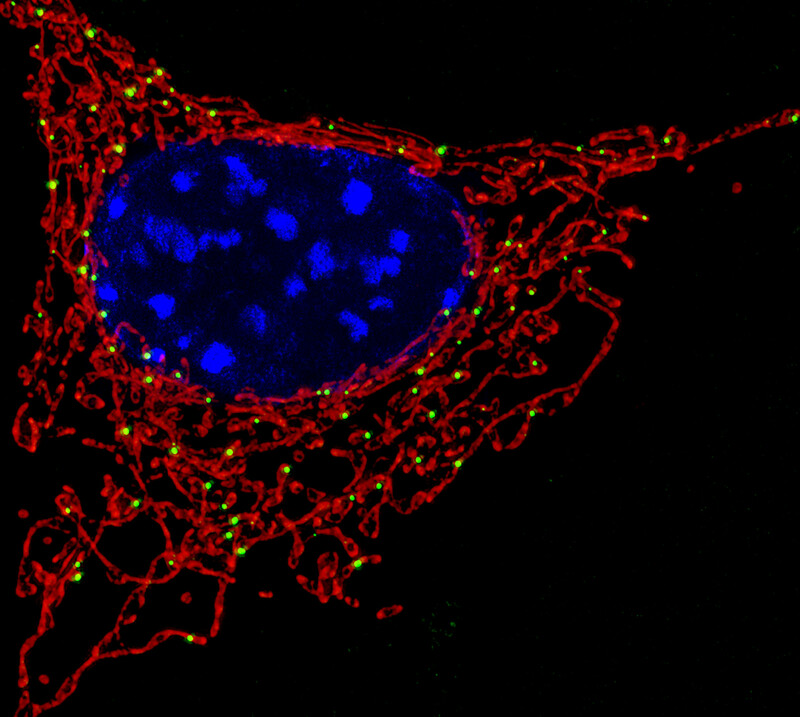 Live-cell imaging showed that when bacterially released PLY was introduced to epithelial cells, it caused changes in the cellular ATP homeostasis and led to morphologic alterations of mitochondria. This is accompanied by strong mitochondrial calcium influx and loss of mitochondrial membrane potential resulting in opening of the mitochondrial transition pore and release of mtDNA. The use of PLY uncovered the mechanism by which the mtDNA is released without harm to the cell, but the question still remains how to reduce this release of mtDNA. In reading about how the over release of mtDNA can cause extreme release of cytokines, and severely damage the body. I couldn’t help but to wondered what were some of the devastating effects of releasing too many cytokines? According to the article “Cytokines and their relationship to the symptoms and outcome of cancer” pro-inflammatory cytokines not only contribute to the progression of cancer, it can also lead to a decline in the host’s quality of life due to being associated with depression, fatigue, cognitive impairment, resistance to cancer treatment, and pain. It is also noted in the article tat physical activity can modify cytokine levels. The article explains how lymphocytes respond to an infection by playing a role in fighting infections by releasing mitochondrial DNA. This raises a question whether microbes play a role in killing other pathogens. Mitochondria is thought to have once lived independent from the eukaryotic cell. With its ability to use and generate energy, I wonder if it is possible that mitochondria can be engineered to increase their ability to respond more vigorously in those with chronic infections. In another study, scientists took a look at the relationship between mitochondrial DNA and cytokine IL-6 in HIV infections, considering they are strongly association with inflammation. It was found that those infected, had a higher level of circulating cell free mitochondrial DNA when compared to those who are not infected. Arshad O, Gadawska I, Sattha B, Côté HCF, Hsieh AYY; Canadian Institutes of Health Research Team on Cellular Aging and HIV Comorbidities in Women and Children (CARMA).. Elevated Cell-Free Mitochondrial DNA in Filtered Plasma Is Associated With HIV Infection and Inflammation. J Acquir Immune Defic Syndr. 2018 May 1;78(1):111-118. doi: 10.1097/QAI.0000000000001650. PubMed PMID: 29630031. It is interesting that you discussed inflammation in other diseases like HIV because I was actually reading an article about mitochondrial-induced inflammation in heart disease. While mitochondrial DNA (mDNA) release can be beneficial in some circumstances, it is also very dangerous because sometimes the inflammation can occur without a present infection – termed sterile inflammation – which is one the factors leading to heart failure. This sterile inflammation occurs when pattern recognition receptors are able to detect damage-associated molecular patterns (DAMPS) that are released from the mitochondria. When the DAMPS activate the pattern recognition receptors, inflammation will occur. When any of the pattern recognition receptor pathways are activated inflammatory cytokines get released and sometimes are over-produced. It would be well worth it to explore the targets affected during sterile inflammation, which would in turn allow us to possibly control mitochondrial DNA release and limit inflammation. As discussed above and in the article mitochondria seems to be a major cause of inflammation that can be detrimental to the organism as a whole or only a certain system. I looked into why the DNA normally found in our own cells causes such adverse effects as listed in other posts and other potential problems. MtDNA is found in every mitochondrion of every cell. However, it is significantly different than the normal human genome in that it is circular and very similar to that of a bacteria (endosymbiotic theory is taken into the account). Normally mtDNA is enclosed in the mitochondria and causes no problems. When a significant amount of it is released immune system treats it like it would a bacterial invasion and promotes inflammation. In addition to a whole slew of problems it can cause to cardiac and other systems just by a mere release of our own lymphocytes, there is another source of mtDNA coming from within- traumatic injury. Muscles are very energy consuming and have a large number of mitochondria to supply them with energy. When muscle sustained a traumatic injury it is possible that cf-mtDNA can be released to catalyze sterile inflammation as a result of trauma. This can lead to systemic inflammation and in some cases death. It is important to keep this perspective in mind for specialists working with patients with trauma. It also gives a meaningful reason for researchers to keep working on keeping mtDNA induced inflammation under control. Your discussion has brought up an intriguing point. As you stated, inflammation occurs after a significant amount of the MtDNA is released from the mitochondria which can lead to multiple complications. An article I found has some contributing factors to further investigate your initial question. It illustrated that red blood cells factor into the possibility for complications to occur. Red blood cells contain TLR 9 cell receptors that bind to the free mtDNA. If the internal environment maintains the homeostatic conditions, then the complications of mtDNA release would be non-existent. However, when elevated, or undergoing systemic inflammation, these TLR 9 cells lose their affinity for the mtDNA and allow for the complications to occur. The reason these mtDNA are so dangerous is due to inflammation and can be regulated if they are contained to an environment at homeostasis. This then brings up a new viewpoint that there could be possibilities to transporting these mtDNA away from the site of infection. MtDNA has long been an important role in the body’s immune system defense against infections. Looking over the article, there can be some things that may go wrong if the mtDNA is not controlled correctly. It is interesting to see how the body requires regulation in almost everything, but if it is not regulated, problems can occur involving autoimmune disorders. My interest increases on how the mtDNA is affected by the natural aging process in life as people continue living, more dysfunction of the body occurs. A study on the topic of aging and mtDNA (1) discusses on increased dysfunction of the mtDNA as aging processes and this dysfunction leads to the apoptosis of cells and induce cancer cells. This leads my interest of how to counter this. Would regulating mtDNA and keeping it from mutating to a dysfunctional protein help people have increased immune system protection and live a longer life then we typically do? If not, can we have increased quality of life from regulating the mtDNA? This gives us more interest with the public on how to this protein could potentially help increase life quality. I find it very interesting how specific the human body is and how something meant to help you can harm you in the process. In regards to the mitochondrial DNA webs released by lymphocytes, these do not immobilize nor kill bacteria like its counterparts, but act as an inflammatory response agent that signals cytokines (specifically interferon type 1) to the site for fighting off foreign invaders. What fascinated me was how high levels of interferon type 1 are found in autoimmune diseases and cancers. With this knowledge, I can’t help but wonder how this protective agent aids in the presence of such awful diseases. For example, in the autoimmune type 1 diabetes mellitus, high levels of the interferon are present and this causes complications in not only daily life but also to those with this condition that are in the military. I feel it is problematic to be in an area where disease and harm are abundant and your body’s defense can do more harm to you than good. I am interested to see how exactly the high levels of interferon type 1 play a part in autoimmune diseases and cancers and if there is a way to counteract the problem.